During a week long, 60 mile traverse of the Sierra, and a gnarly weekend trip into the Uintas, the Core proved itself as a functional, reliable wrist watch and altimeter. This watch is super easy to use, and proved so reliable my party began to doubt our map when the two failed to agree on altitude. 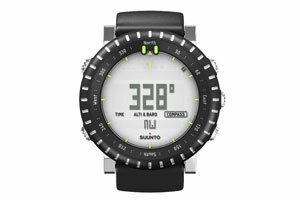 It's basically a simple, three mode instrument: altimeter, time piece, and compass. We mostly toggled back and forth between time and altitude mode, where the log was easy to set up for cumulative elevation gain, Of all the altimeter watches I've tried in the past two years, this one really delivered. The large, easy to read face won me over, it's the expense that will give you second thoughts.